...... Various types of data can be placed on one page. So, your visitors need no more reload a large number of pages to find the information they want. Deluxe Tabs will really lighten the process of site building as it allows to place much information within one page without creating many others. But for all that, all the information is parted and structured. You are free to create tabs containing text, images and practically all kinds of information in various combinations. You may also create any desirable design inside the tab with HTML. And you can add as many tabs as you wish! 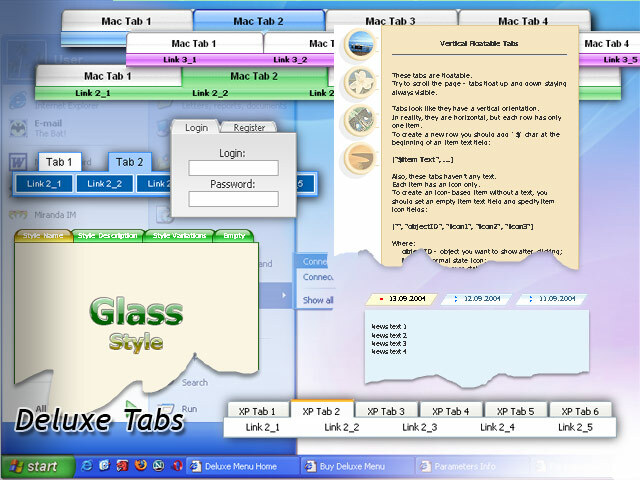 Try Deluxe Tabs! Qweas is providing links to Deluxe Tabs 3.3 as a courtesy, and makes no representations regarding Deluxe Tabs or any other applications or any information related thereto. Any questions, complaints or claims regarding this application Deluxe Tabs 3.3 must be directed to the appropriate software vendor. You may click the publisher link of Deluxe Tabs on the top of this page to get more details about the vendor.